Greyhounds are gentle, sweet natured, docile, affectionate and dedicated dogs; they are all heart, aren't they. 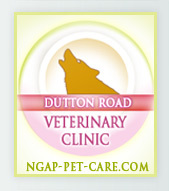 Did you know that they actually have some differences in their cardiovascular system compared with other breeds? Let's start from their heart size; in veterinary medicine, there is a non-invasive method where cardiac size can be easily, rapidly, and objectively determined. The method is called vertebral heart size (VHS). With this method, measurements of the heart from lateral chest films or thoracic radiographs are used in a simple formula to determine the total VHS, based in the published reference range for VHS in dogs, which is 8.5 to 10.6. In clinical practice, a VHS above the reference range on lateral thoracic radiogaphs supports cardiomegaly (enlarged heart), which is frequently associated with cardiac pathology, such as dilated or hypertrophic cardiomyopathy, pericardial effusion, pericardioperitoneal diaphragmatic hernia, tricuspid dysplasia, ventricular septal defect, or patent ductus arteriosus, among others. 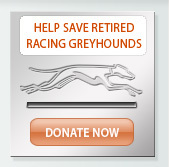 Last year we generated reference ranges for VHS in Greyhounds, and they are 9.9 to 11.1. 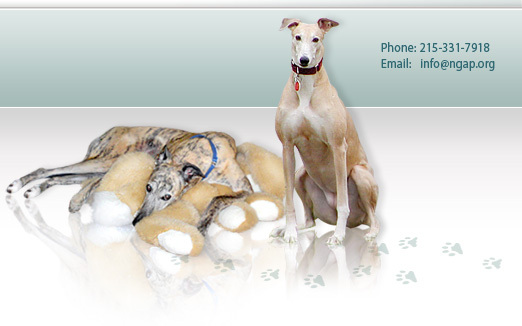 This range confirms that healthy Greyhounds have bigger hearts than dogs of other breeds. Since the large heart in Greyhounds occurs in both, trained and untrained dogs, and it does not regress after cessation of training, previous studies suggested that it is due to genetic factors and not acquired through exercise and training. 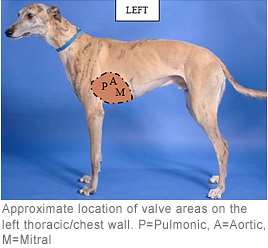 The heart sounds normally heard in healthy dogs are S1 (associated with closure tensing of the AV valves at the onset of systole) and S2 (associated with closure of the aortic and pulmonic valves at the end of the systole). In addition to these normal sounds, other sounds may be present, such as heart murmurs. Heart murmurs (abnormal heart sounds) are not usually part of the normal cardiac physiology, however, sometimes they are not clinically significant. The heart murmurs are described by their timing during the cardiac cycle as systolic (when the heart is emptying or diastolic (when the heart is filling). The intensity of a murmur is graded on a 1 to 6 scale, and its point of maximal intensity is located and described as apex (apical or lower part of the heart) or base (basilar or top portion of the heart). 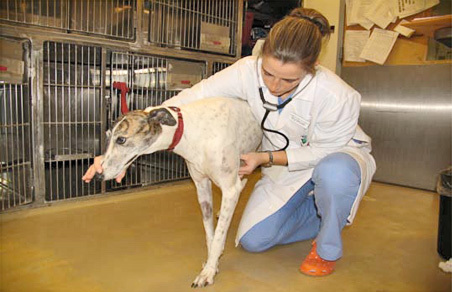 In 2006 we made the observation that a grade 1-2/ 6 left basilar systolic murmur was ausculted in many Greyhound blood donors, without evidence of abnormalities on echocardiograms, sometimes the murmur is not heard by auscultation of the heart, but the finding of a bruit (a heart sound heard over a vessel), which is heard using a stethoscope in the carotid artery in the neck, confirm the presence of the murmur. In our study, we found that the b1ood flow velocity in the aortic valve in the Greyhounds with murmurs was significantly higher than in the Greyhounds without murmurs. In conclusion, although a soft murmur is common in adult Greyhounds, it does not appear to be associated with a congenital defect (e.; it is normal in sight hounds) or any CBC differences unique to this breed. Due to these peculiarities in the Greyhound, we frequently receive referrals or consults of Greyhounds suspected of having heart disease, when indeed these findings are normal breed-related idiosyncrasies. This should be taken into account to avoid misdiagnosis and unnecessary medication. Thromboelastographic tracings in retired racing Greyounds and in non-Greyhound dogs. Vilar P, Couto CG, Westendorf N, Iazbik C, Charske J, Marin L.	J Vet Intern Med. 2008 Mar-Apr;22(2.):374-9. Postoperative bleeding in retired racing Greyhounds. Lara-Garcia A, Couto CG, Iazbik MC, Brooks MB J Vet Intern Med. 2008 May-Jun;22(3):525-33. Results of a web-based health survey of retired racing Greyhounds. Lord LK, Yaissle JE, Marin L, Couto CG. J Vet Intern Med. 2007 Nov-Dec;21(6):1243-50. Vertebral heart size in retired racing Greyhounds. Marin LM, Brown J, McBrien C, Baumwart R, Sammi VF, Couto CG. Vet Radiol Ultrasound, 2OO7JuI-Aug;48(4):332-4. Comparison of glomerular filtration rate between Greyhounds and non-Greyhound dogs. Drost WT, Couto CG, Fischetti AJ, Mattoon JS, Iazbik C. J Vet Intern Med. 2006 May-Jun;2O(3):544-6. Left basilar systolic murmur in retired racing Greyhounds. Fabrizio F, Baumwart R, Iazbik MC, Meurs KM, Couto CG. J Vet Intern Med. 2006 Jan-Feb;20(1):78-82.